Forget that bloke who works for Tourism Queensland. 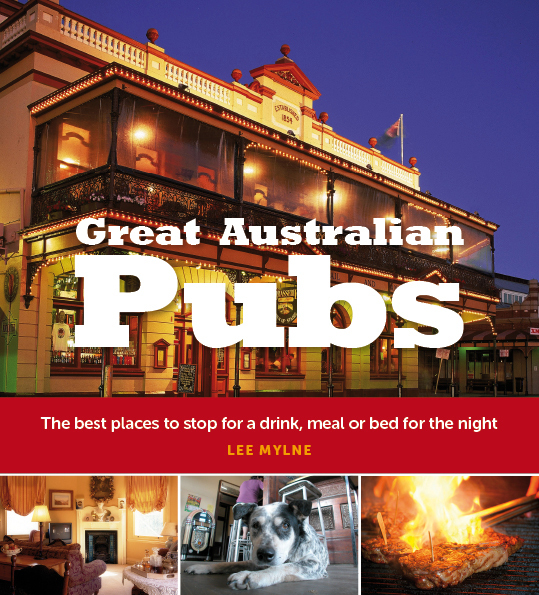 Suddenly it seems that in many people’s minds, I’m the person with the Best Job in the World – and all because I’ve written a book called Great Australian Pubs. And I got to spend about six months last year travelling around the country checking out the 100 pubs in the book, which was published by Explore Australia (a division of Hardie Grant Publishing) and released in February. Now, the question on everybody’s lips is “What’s your favourite pub?”. With 4000 pubs, taverns and bars in Australia, that’s a very tough question. When researching my book, I started with some of the most famous pubs, places like Melbourne’s Young & Jackson and Sydney’s trio of the ‘oldest’ – the Lord Nelson, the Fortune of War and the Hero of Waterloo – and added some outback icons, like South Australia’s Prairie Hotel at Parachilna and the Daly Waters Pub in the Northern Territory. Everywhere I went, I asked for other recommendations. My travel plans changed even while I was on the road, as new finds cropped up. My original list in each state or territory changed as I went along. There are so many great pubs it’s just too hard to pick a favourite. The atmosphere of a pub can be different depending on the day of the week, the time of day, the month, or just the company you are keeping. That said, a few I really liked were the Pub in the Paddock in Tasmania’s Pyengana Valley, the Shipwright’s Arms in Hobart and the Apollonian on Queensland’s Sunshine Coast. The most beautiful old pub was the ornate Imperial Hotel in Ravenswood, south of Townsville, standing resplendent in what is almost a ghost town. The best beer gardens were in Sydney, at the Oaks Hotel at Neutral Bay and the wonderful water views from the Newport Arms. Then there was the almost surreal experience of sitting on the verandah of the Blue Heeler in the Queensland outback town of Kynuna in the late afternoon, watching brolgas dance in the dust outside the front door. At Goat Island Lodge in the Northern Territory, I arrived by helicopter to sit at Casey’s Bar and keep a wary eye out for the resident crocodile; in Victoria, I arrived at the Blue Duck Inn on horseback, as so many patrons do. It was quite a trip. And the book looks fantastic. It’s glossy, full of images and information, and portable enough to throw in your car when you’re travelling or just leave on the coffee table for browsing over a beer. But I’m curious…what’s your favorite pub?